Discussion in 'Guitars in General' started by skintknuckle, Mar 14, 2008. Anybody have one? Do you like it? I hope this thread stays civil. This "Chromyte center block" concerns me, because people are saying that that's basically balsa wood, but I like the lighter Les Paul idea. I wonder how much of the core of this guitar is "Chromyte". Sorry, couldn't resist. Assuming you mean a Les Paul Studio Lite, I had one. I liked it. Beautiful guitar. Sold it when I bought a Historic '57 Goldtop. Do you mean the Les Paul Custom Lite they produced from 1987 - 1990? That's about half the depth of a regular Custom, solid mahogany body, with a maple cap? If so, then that's what im running as my gigging #1. I like it a LOT! The neck scale is closer to the PRS 22 fret scale (cant remember measurements off my head) than the usual Les Paul scale. With gain cranked all the way up, i cant really tell much difference between the Lite and a Standard, it's certainly got a lot more guts to it than the SG. Clean, it's closer to the SG mark - quite punchy, not too muddy - really nice bite when you hit the edge of breaking up. 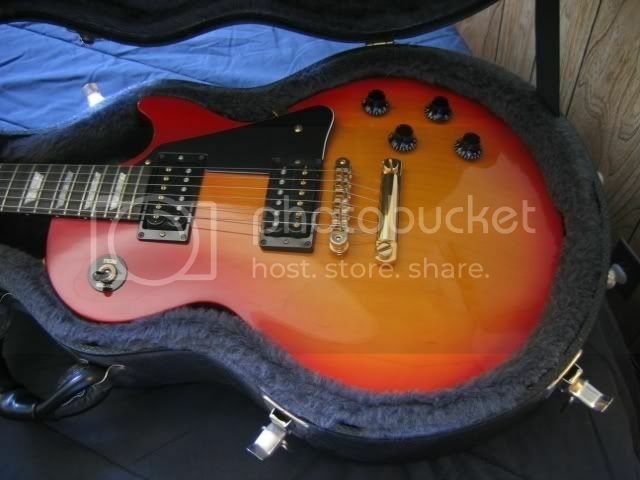 The Les Paul Studio Lite is a great guitar. My bro has one exactly like the one in the picture above, except the gold hardware is now completely worn, and it has Duncan Alnico II pro pups in it. It is the meatiest sounding guitar I have ever heard in my entire life. And it won't break your back to boot. That's odd. I didn't know Balsa was expensive. Or rare in large pieces. I think a 4-1/2Lb. Les Paul would be a bit neck heavy. 7Lbs. would probably balance OK. I'd love to hear how yours comes out. I have a book on the history of the Les Paul and it says that they are made with balsa which is expensive, rare in big chunks, and sounds very rich. Who knew that the same wood I use for tech ed could make a good guitar? I'm on my second Studio Lite. Had a red one with black hardware in the mid-90s and sold it. Missed it...so when another came available to me I grabbed it. This one is tobacco sunburst. I like 'em. Good enough to scratch my LP itch...and for less than a grand to boot. What is the difference between the custom Lite and the Studio Lite?